Reggie found his way to CrossFit a few years ago and dove in head first. He has a Bachelor’s degree in Exercise Science from WSSU, and a passion for understanding how the human body works. Reggie has been coaching CrossFit since 2013 and holds certifications in CF-L2, CF endurance, and USA Weightlifting Performance 1. Reggie truly cares about the well being of every one of his athletes and is known for going above and beyond to help members improve their lifts, skills, and overall fitness. Tiffany and her family have been a part of our gym since 2015. She is a new mother of three and has recently started CrossFit. She has seen how friendships develop through working out together and excited to be part of that! Brittany is a former high school swimmer and cheerleader who continued her love for a healthy lifestyle into CrossFit. Brittany has her CF-L1 along with her National Certificate of Personal Training. 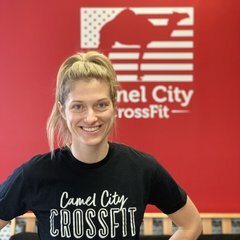 Brittany is able to stay active outside of CrossFit as the mother of a toddler. She works hard to maintain balance in her life and helps our athletes to do the same. 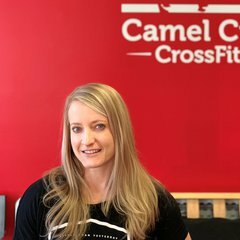 Kristy joined the Camel City family in October 2017, shortly after her family moved from Richmond, Virginia for her husband’s job. She is a busy mom to two active boys - Drew and Max. Kristy was a competitive gymnast and swimmer until college, and discovered Crossfit in 2015. She obtained her CF-L1 in May 2017 and plans to pursue a USAW certificate in the near future. Outside of the gym, Kristy loves to be outdoors with her family, on the sidelines at her kid’s sporting events, she loves the mountains and the beach, and will take any opportunity to sit outside and soak up the sun and fresh air. Philip was born and raised in King, where he still lives with his wife Mandy and 4 children Adalee, Caris, Everly and Bryce. He played high school football and also wrestled. Philip began doing Crossfit with his wife in 2017 and was instantly hooked. He has a CF-L1 and plans on taking the CF-L2 after gaining more coaching experience. Philip would also love to take the gymnastics, aerobic capacity, and Crossfit kids certification courses to become a better all-around coach. He also currently the pastor at Germanton Baptist Church. John has spent his life playing various sports and loves anything that involves being outdoors. He started doing CrossFit in 2012 and obtained his Level 1 Certificate in 2013 at San Jose’s NorCal CrossFit. John is a full time Firefighter for the City of Winton-Salem. He is also a member of the Wellness Committee for WSFD and helps run Physical Training for the Fire Academy Recruits. John also has his Emergency Medical Technician (EMT) certificate. 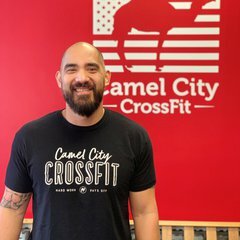 He loves every aspect of CrossFit and having the ability to help train his peers at work and at the gym to become healthier and more active, both inside and outside the gym. Jay earned his L1 at NorCal CrossFit while living in California. He has continued to increase his knowledge of functional fitness by attending advanced weightlifting seminars, The Movement Fix mobility seminar, and has his CF endurance certificate. Inside the box, Jay is a Jack of all trades. He enjoys helping athletes improve their lifting, gymnastics, and mobility. Outside the box he enjoys snowboarding and anything else that can keep him active and outside. One of Jay’s favorite things is watching an athlete succeed. Travis began Crossfit in the fall of 2015 while in college. He obtained his Bachelor’s degree in Exercise Science from Appalachian State University in 2017. Travis is currently a second-year student physical therapist seeking his Doctor of Physical Therapy degree from Winston Salem State University. 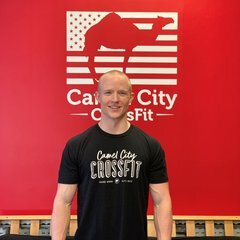 Travis coaches the Ladies Barbell class and assists in coaching Crossfit classes at Camel City. Outside of Crossfit Travis enjoys taking trips to the mountains, skiing, hiking, and mountain biking. 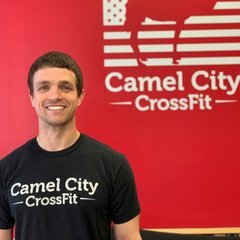 Adam started at CrossFit Wilkesboro in 2013 and joined Camel City in 2014. He graduated from Appalachian State University in 2011 with a B.S in Health Promotion and Exercise Science. After college Adam began a career with the YMCA of Northwest North Carolina where he worked his way up to Wellness Director. For the last five years he has helped members reach fitness goals of all levels. He currently works for Fleet Feet and New Balance Winston Salem. Adam obtained his L1 at CrossFit Wilmington in 2015. He is a big kid at heart and will make sure that every new member feels comfortable and at home!